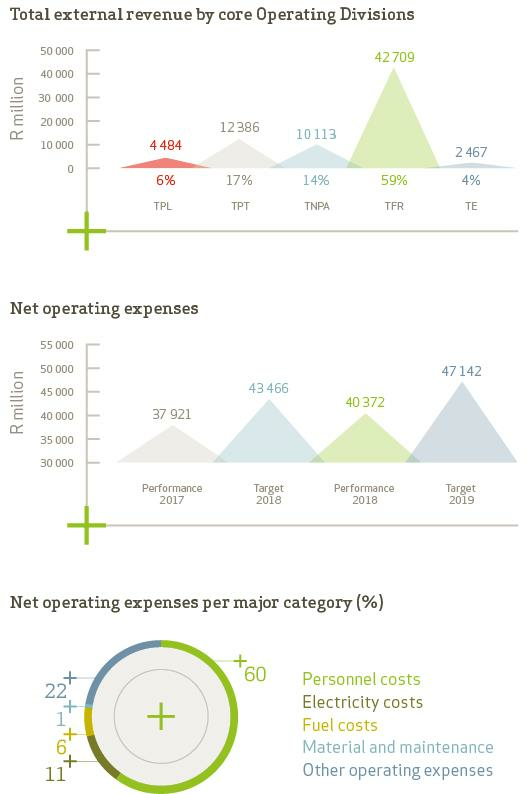 Transnet continues to perform above expectations in a slowrecovering economy, confirmed by a significant 18,0% increase in its key profitability measure, EBITDA. Despite the impediments associated with current market conditions, Transnet has continued to execute the Market Demand Strategy (MDS) through a dynamic management approach, holding steadfast to the key principles of its strategy. 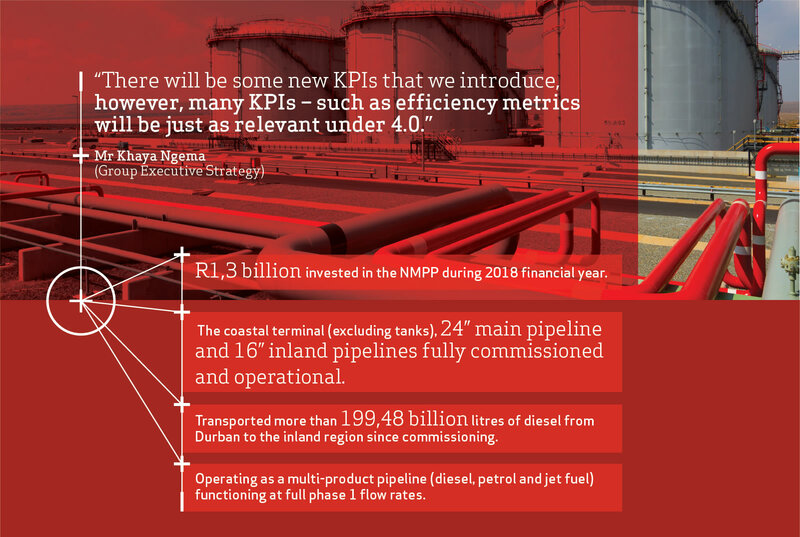 Improved operational efficiency and productivity lead to increased volumes in the rail and port businesses, supplemented by management‘s continued cost-management mindset, optimisation and the rephrasing of capital spend, all of which has resulted in Transnet achieving the current year’s impressive results. The gearing ratio decreased to 43,4% (2017: 44,2%). This level is below the Group’s target range of 50,0%, and is well below the triggers in loan covenants, reflecting the available capacity to continue with its investment strategy, aligned to validated market demand. The gearing ratio is not expected to exceed the target ratio over the medium term. The cash interest cover ratio (excluding working capital changes) at 3,0 times (2017: 2,9 times) is in line with the internal target of 3,0 times, reflecting Transnet’s strong cash-generating capability. This is also significantly higher than the triggers in loan covenants. A Revenue for the year increased by 11,3% to R72,9 billion (2017: R65,5 billion), driven by a 4,3% increase in railed export coals volumes and a 6,5% increase in railed automotive and container volumes. The respective increases were due to improved operational efficiency, attributable to the deployment of new-generation locomotives on the network, and growth in market share arising from a shift in rail-friendly cargo from road to rail. Port container volumes also increased by 6,1%. B Operating costs increased by 6,5% to R40,4 billion (2017: R37,9 billion), notwithstanding a 13,6% increase in fuel costs. Numerous cost-reduction initiatives implemented throughout the Company helped to limit the increase in operating costs, resulting in a R3,1 billion saving against planned costs. These initiatives included limiting overtime, reducing professional and consulting fees, rolling out programmes to measure condition-assessment versus time-based maintenance execution, and limiting discretionary costs relating to travel, accommodation, printing, stationery and telecommunications. C Earnings before interest, taxation, depreciation and amortisation (EBITDA) increased by 18,0% to R32,5 billion (2017: R27,6 billion) with a resultant increase in the EBITDA margin to 44,6% (2017: 42,1%). D Depreciation, derecognition and amortisation of assets increased by 1,6% to R13,7 billion (2017: R13,5 billion), due to the revaluation of property, plant and equipment, partially offset by a significant decrease in derecognition costs. Accordingly, profit from operations after depreciation and amortisation increased by 33,7% to R18,8 billion (2017: R14,1 billion). E Impairment of assets, amounting to R1,4 billion (2017: R2,5 billion), is primarily due to the impairment of property, plant and equipment, resulting from derailments, as well as impairments of trade and other receivables. F Fair value adjustments amounted to a R410 million gain (2017: R1,6 billion gain). These adjustments are mainly due to investment property fair value gains, recognised in terms of IAS40 : Investment Property, partially offset by losses on credit valuation adjustments and credit contingent default swaps, in terms of IFRS 13: Fair Value Measurement and IAS 39: Financial Instruments: Recognition and Measurement. G Net finance costs increased by 14,7 % to R9,9 billion (2017: R8,6 billion) in line with expectations, due to the increased cost of borrowings. Capitalised borrowing costs amounted to R2,9 billion (2017: R3,9 billion). H The taxation charge of R2,8 billion (2017: R1,5 billion) is largely due to an increase in the deferred taxation, mainly from an increase in wear and tear allowances that are deductible for tax purposes. This was partially offset by the impact of the Company’s calculated taxation loss. The effective taxation rate for the Group is 36,4% (2017: 35,2%), which was impacted by expenses that are non-deductible for tax purposes. * Included in cash and cash equivalents are restricted Transnet Pipelines Rehabilitation Trust accounts amounting to R293 million.